HomeKitchenKitchenwareKitchen ToolsUniversal Silicone Lid Food Wrap – Bowl Pot Lid- Silicon Stretch Covers Lids Pan and more. Kitchen Vacuum. They’re environmentally-friendly, eliminating the need to repeatedly buy expensive plastic wrap -Plastic tops are round yet stretchy enough to fit snugly over odd-shaped mugs, pots, cups & bowls Microwave-safe & heat-resistant to 450 F so you can quickly reheat & enjoy delicious leftovers. Can use in oven or fridge!!! 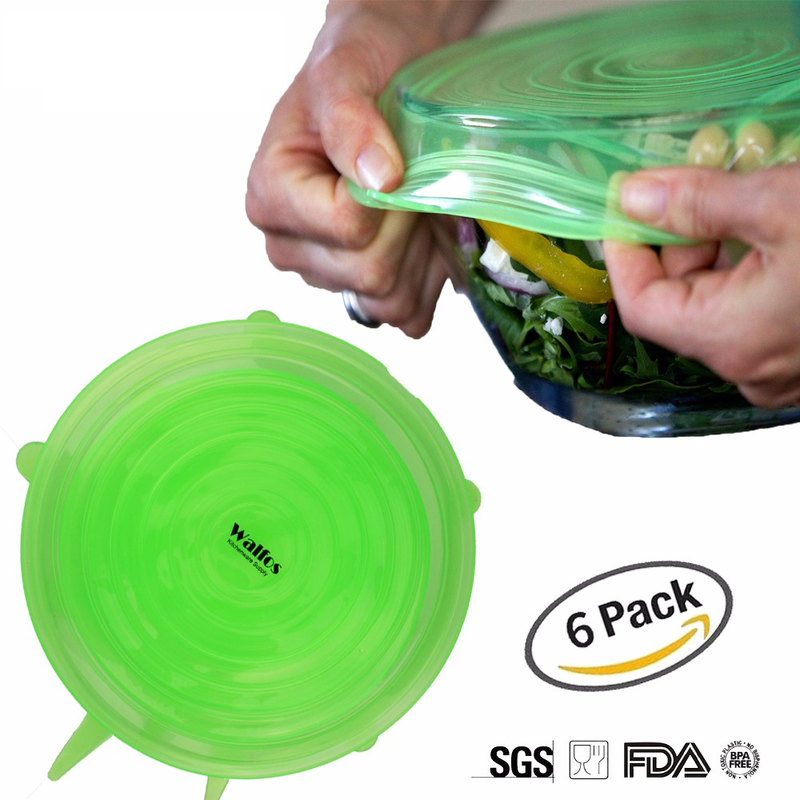 -Features non-toxic, BPA-free, dishwasher-safe & leak proof, air-tight seal so foods stay fresh! Sizes: 2.6″, 3.7″ 4.5″, 5.7″, 6.5″ and 8.3″. Total 6 pieces per set. You get 6 covers: (1) 2.6″ (will stretch to 3.5″), (2) 3.7″ (will stretch to 5″), (3) 4.5″ (will stretch to 6″), (4) 5.7″(will stretch to 8″), (5) 6.5″ (will stretch to 9″) & (6) 8.3″ (will stretch to 11″). Very high quality flexible silicone material and the WALFOS logo will be on biggest lid. Original quality at a good good price!!!!!!!! Really nice! Good quality! Even better is the price!! Reusable storage lids made from high quality, food grade silicone. Use instead of saran wrap to cover almost any dish, bowl or plate with air tight seal. Each set includes six different sizes, and with the combination, you will be able to cover things ranging from 2.75″ – 10″. It doesn’t matter if they are round, square, oblong or rectangle. These lids stretch to any shape and still provide an airtight seal. Sturdy and strong that it actually provides a stack-able surface once in place. Available for use in the fridge. Below is comments from our clients. This is a very practical tool for the kitchen! They work really well. I am using them to cover mixing bowls (which do not have lids). And I hate using plastic wrap. The smaller ones are good for covering cups when my kids don’t finish their drinks. These things are very ‘sticky’ and with the right size/bowl ratio, they do not leak. If you choose a size too big however, it may not fit snugly. The only con I have found is that since they are so ‘sticky’, storage can be a problem. If I put them in my drawer with the hot pads/dish towels, they get fuzz all over them. (This is where I would like to store them, but cannot.) Storage on a shelf means they gather dust pretty quickly. So I just found a big Ziplock bag to store them in, but it is kind of hard getting them in and out of the bag. Not a huge problem though. I received this product in exchange for an honest review, and my opinions are based on my actual user experience. These are awesome! You will not regret buying these. Do not spend anymore time trying to find lids, with these they fit on everything and stay put. They are easy to use, dishwasher safe. They have a lot of different sizes. We have used these everyday since we received them. They are round but they work on square bowl to. No more plastic wrap! I have pictures of how they come, which is nothing fancy just in a plastic bag. 2 of the pictures show them on a square bowl. As long as nothing is wet, the bowl or top, they will fit on and stay snug. These are so much better than putting plastic in our landfills. Worth every penny! I received this product at a discounted price in exchange for an honest and unbiased review. I love these. I have a bunch of glass bowls that I use for mixing ingredients, dips, pasta/chicken salads, etc. I love my bowls but they do not have lids. I have to transfer food to a covered dish or waste saran wrap or aluminum foil to cover them. These lids fit on my many of my bowls perfectly. I can even stack my bowls in the fridge using these. I have ran them through the dishwasher and they held up great. I am excited to be able to try these at a discount in exchange for my honest review. I plan on buying a set for my moms mixing bowls that she uses while baking. 1/15/16 – I can back to add that the smallest lid fits a soup can perfectly! I took a pic but it won’t let me edit my review to add it. Maybe you like our below lid, you can find in our store. 6 Piece Heat-Resistant Kitchen Utensil Set. Non-Stick Nylon Cooking Utensils With Rack Holder.